In a Victorian society, an engineer has come up with a clever boat lift for his canal, using counterweights. In order to work correctly and most efficiently, the operators will need to know how much each boat or barge actually weighs. How could he do this? Clearly the obvious answer is to put the boat into a tank and see how much the water level rises; but the point of this system is to weigh the vessel for lifting - so any solution that involves picking the ship up isn't practicable. Plimsoll lines could work; but not all boats would have them (and you'd need to establish how much the boat actually weighs before you can accurately apply these anyway. The best I've been able to come up with so far is a dry-dock - float the ship in, empty the water out completely and then fill it up again with a specific amount; then measuring how high the water is should give an answer. But it's not a very elegant (or fast) solution - can anyone do any better? Edit to answer some of the comments: This is a 'dry' boat lift, it which the vessel sits on blocks (similar to those in a dry dock) and is lifted out of the water; hence the need to know the mass (rather than a 'wet' lift where the mass would always be the same). You describe a lift that uses counterweights, suggesting you want to weigh the ship to know how much counterweight to use. Depending on your lift design, that may not be necessary. Attach your lift to the hull of the ship. Gradually add more counterweight. For every ton of counterweight added, the ship will rise a little out of the water (equal to reducing its water displacement by one ton). The operators keep adding counterweight until the ship is out of the water, and thus have exactly the counterweight needed. They then can complete the lift (or lowering) by adding a little additional force (or weight adjustment) one way or the other. To save time, the lift operators can use the methods suggested in AlexP’s answer to get a first estimate of how much counterweight to use, being careful to underestimate. Your lift is also a scale. When the entire ship is hovering out the water, the amount of counterweight (divided by whatever mechanical advantage you have) is the ship’s weight. The operators don’t need to know that to figure counterweight –they already have that. However, it might be useful for other purposes, such as assessing the toll. The operators will also know from the engineer that a certain amount of counterweight (and thus weight of the ship) will break the lift, and will be careful not to put that much on. The Victorian engineer--say for example Mr. Isambard Kingdom Brunel--would of course be interested in having a method which would give the exact weight of a ship; but in practice he would settle for a method which gave an approximate result, provided the result was not too wrong, because he would need to design his installation with a considerable factor of safety anyway. In his time they has some empirical formulas which gave an idea of the volume of the ship; similar formulas combined with the ship's draft could have been derived in order to estimate the displacement and by consequence the weight of the ship. However, the entire question is based on questionable assumptions. Ships were not, and are not, designed and built so that they can be lifted out of the water. If one tries to lift a ship out of the water it will break unless a lot of care is taken with the supports. If you look at a ship in a dry dock you will notice the it needs to be supported over the entire length of the keel -- the keel is nowhere near the strength to resist being supported on a small number of points. The Victorians did build a number of boat lifts, such as the lift on the Dorset and Somerset Canal or the Anderton Boat Lift. 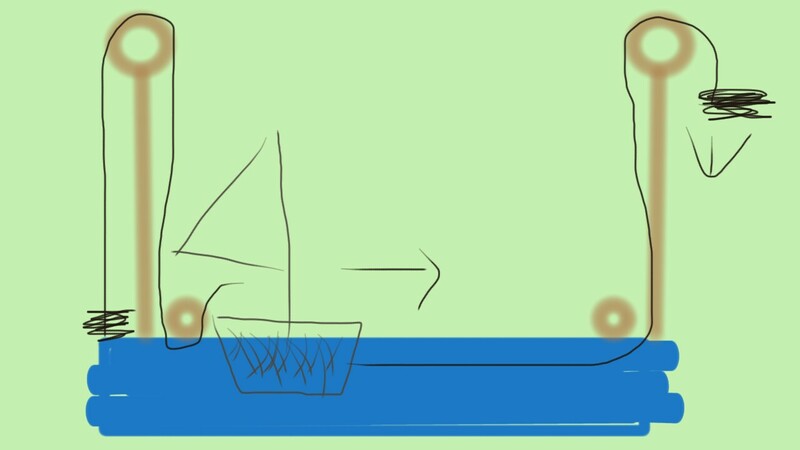 These work by lifting the ship while it is floating in a caisson; the entire question of precisely calculating the weight of the ship is circumvented by the expedient of adding or removing water until the up-going and down-going caissons are in equilibrium, that is, the water rises to the same level. This may seem unintuitive, but if the ship is being lifted while it is floated in water, then its mass may not matter. This is because if the container holding the water is always of the same depth, then the water plus the ship floating in it will always weigh exactly the same. You only need to know the weight if you are lifting the ship on its own, or in a container in which the water depth varies. Similarly unintuitive -- the quantity of water "used" by a ship or ships in transiting a lock system is always exactly the same, regardless of the number/shape/size/weight of the ships. As Archimedes discovered (Eureka! ), the weight of anything floating in water is equal to the volume of the water displaced by that floating thing. By the Victorian era, ship hulls, especially ones made of metal, were drawn out in sketches before they were assembled in real life. From the sketches, accurate measurements could be made. A little bit of integration would determine the volume of water displaced by a vessel when the water line came up to point x on the hull, usually something painted onto the hull. 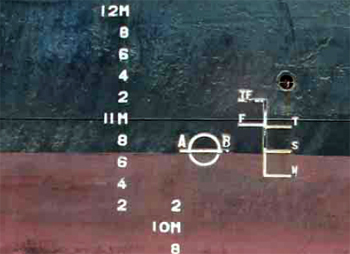 In the US Navy, we still use those lines to estimate the mass of fuel that we have loaded onto and off of the ship, to determine if we are leaking fuel. The lines are at both the front and the back of the ship, and you can use the markings front and back, in case the ship is trimmed poorly, that is, it is lower in either the front or the back than the other, to determine the total 'displacement.' And if you look up wikipedia articles on ships, their size is listed in displacement rather than weight. So the Victorians could and did make tables for their ship captains, to tell them what the total displacement of the ship was based on draft. This is very important since it could be used in reverse...namely how much mass can you take onto your ship (fuel and cargo) before your draft exceeds x. If he were going into shallow waters, a ship captain would not want to overload his ship. It's a rotating structure that holds two identical pools of water in each of its extremities. When a boat navigates into one of such pools, it'll dislocate an amount of water whose weigh is identical to its own, which makes the lift perfectly balanced without having to run any calculations or estimations on the ship's weight. It can even have one boat coming up and one coming down at the same time. No need for a full dry dock,which is only really necessary if you're working on the hull of a boat. We already have a system that manipulates boats: canals. If you have a canal structure such that the basic known depth allows a boat to float in, and then a pre defined volume of water is "flooded" into the canal lock, you can get total displacement without all the complications of a dry dock. A bonus to this system is that it can be integrated with the lift, so as soon as you calculate the counterweight you'd be able to engage the lift. Victorian engineers were capable of calculating the immersed volume of a hull. They did not do this very often because there was no need. For instance, Froude calculated how laboratory tests of ship hulls would scale up to real life. The obvious answer is to know the weight of each boat when built and know the weight of the cargo it holds, after all the cargo had to be loaded and balanced prior to sailing. I bet the captain of each ship had a pretty good idea of his ships displacement (or some other concept of weight that could be used to calculate the mass of the ship for lifting) that could simply be recorded in a ship log and given to the dockmaster. Since fine precision isn't necessary, a rough estimate would suffice. I don't know whether they'd be capable of such a calculation, but another possibility would be to apply a known force on the ship (mass) and watch how it's accelerating. Place the ship somewhere such that a tower can be built (some distance away) in front of it (tower A) as well as another tower directly behind it (tower B). Use rope to tie the mass A via two rollers to the front of the waiting ship: one at the top of the tower, one at the bottom. Do the same setup for tower B, but don't fix the rope to the back of the ship, just have someone there who can attach it to the ship on command. Now let the mass A fall. This will accelerate the ship with a force $g * m_A - F_F$, over a time period $t_A$ until the mass reaches the ground. 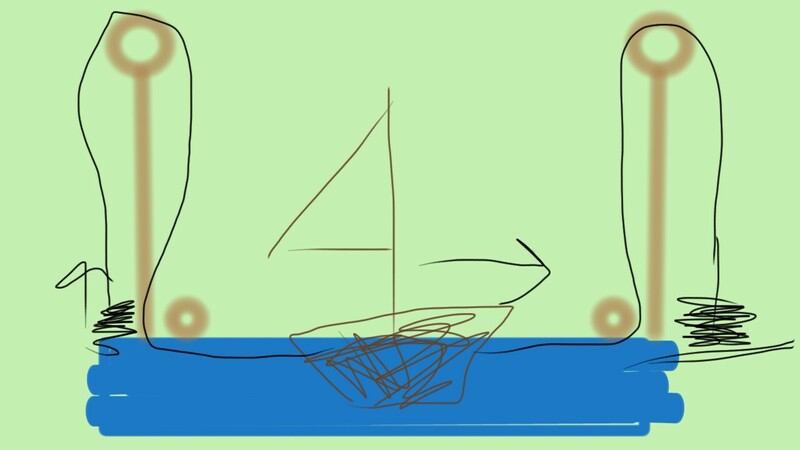 Immediately when mass A hits the ground, give command to attach the other rope which is connected to mass B to the back of the (moving) ship. This will slowly decelerate the ship with a force of $m_B * g + F_F$ and lift mass B of the ground, until after $t_B$ the ship comes (briefly) to halt, before moving backwards. Now to keep things simple let's assume constant friction $F_F$ and thus constant acceleration in both cases (this will introduce a lot of error in the calculation, though). Calculate those two from the measurements. As you might have guessed from the drawings, this is a quick and dirty sketch that I'm doing on my mobile phone. Thus everything above might be completely wrong. It is doubtful you will have a uniform weight on a particular boat that comes through your canal. Even the same ship on two trips will have different weights because of cargo, bilge, crew, and a lot of other factors. This leaves you with two options if you insist on the boat lift: Overengineering or pre-lift weighing. Other answers have gone into the specifics of how you'd obtain the weight of a vessel. The issue is that this takes time, and the longer it takes you to get a vessel through your canal the less money you are making, and the longer it takes to ship things. There's always the "just add weight to the counterweight bucket until it works" option, but that lengthens the time of the lift as well. Overengineering is going to increase your construction costs, which is a big negative when you're trying to make money on your canal. It also would have bigger maintenance costs (as you have a bigger apparatus in general). You also have some major issues if you have a failure during a lift, which requires further overengineering of redundancies or accepting a certain level of risk. The solution I would recommend to your canal owner is to just install a Lock in his canal. They have been used for millenia and the technology is not that complex (but the basic design can constantly be improved by technology. There's a reason we still build them). It circumvents your weight problem, because you just need to pump water in and let buoyancy take care of the rest. It also would be faster than a lift system requiring weighing beforehand (the drydock option requires more work than the lock in terms of pumping, and similar sized facilities), and is simpler and safer than the overengineered solution. Even if you have an intricate pump system, and you suffer a failure of some kind, you can always operate the lock "manually" by opening the gates individually to flood and drain the lock. Or, if that's not an option, your fail-safe is to release the lower lock and then your boats are just "stuck" on the lower level canal until it can be repaired (which is far preferable to the "worst case" scenario of the lift, which is a boat shattered upon the ground). If you really MUST have a dry dock lifter, then I would recommend a solution that uses a combination of a test weight, and the amount by which the boat displacement changes. Merely attached a fixed counterweight to the ship, observe the amount by which the boat rises in the water, and the weight of the ship can then be estimated based on the amount by which the water displacement of the boat was "negated"
Not the answer you're looking for? Browse other questions tagged engineering ships victorian-era or ask your own question. How to fire your engines for a near-future trip around the solar system? The Infinite Sea, how narrow can that be? Could 'robotic' prostheses be possible in the victorian era?